Words Done Write: Do you have #Hashtagitis? Out of all the social media platforms, Twitter is my most favorite (#TheLittleBlueBirdRules). Aside from meeting new people (#MixingAndMingling #OnlineCocktailParty), forming great relationships (#LifelongFriendsAndContacts #NoIDoNotMeanBootyCalls), and learning lots of good info (#InterestingArticlesMixedWithTimeWastingYouTubeVideos), the unexpected perk of tweeting is, wait for it (#BarneyStinsonRocksMyWorld), fun with hashtags! When I train clients on how to use Twitter (#WayTooMuchProBonoWork), I tell them how to use hashtags for events, trending topics, chats, and more. The lesser known benefit of hashtags is just downright silliness (#KnockKnockWhoIsThereSamAndJanetSamAndJanetWhoSamAndJanetEvening #SomeExchantedEvening #GetIt?). Fortunately for me, I've discovered some other tweeters (yes, @staceysoleil, #SpandexQueen, is one of them) who share my love of all that's flip and sarcastic (#SmartAleck). Expressing yourself in 140 characters can sometimes be a challenge (#Impossible), but incorporating hashtags into your tweets can be quite effective (#WorthlessButFun). As a matter of fact, they can be quite liberating (#YouCanUseIdiotAsAHashtag). A clever hashtag can be just as revealing and insightful as the content of the actual tweet itself (#SaidInMyMostTrustworthyProfessorVoice). They are also a way to show more of your personality (#DrJekyllOrMrHyde). The problem is that I now dream in hashtags (#MrSandmanSendMeATweet). I think in hashtags (#PleaseInsertACartoonBubbleAboveMyHead). I have to refrain from inserting hashtags into business emails (#MeetTheDeadlineOrDie). It's become a real problem (#PleaseSendMeMoneyForHashtagitisMeds). Am I suffering in this alone (#CanWeFormASupportGroup)? Do you know my pain (#DoNotBeAfraidToStepForwardAndAdmitYouAreAfflictedToo)? Do YOU have #hashtagitis (#CanIGetAnAmen)? Admitting your addiction is the first step on a long road of treatment (#FellowHashtagAddictsUnite). We can fight this together (#PowerInNumbers #HashtagRoyality). Sometimes I suspect I might be a lost cause (#GiveMeHashtagsOrGiveMeDeath), but I really think I can beat it (#NotAChanceInHEDoubleHockeySticks). Can you relate? Let's talk about it (#DrAmberIsInTheHouse). Hello. My name is Amber and I have #hashtagitis (#InsertWordsOfSupportInTheCommentsBelow). LOL~!!! This is #TooFunny ~!!! I was in on a fun hashtag last night with @BuzzEdition after #OMG @HarveyLevinTMZ followed her, Susan let loose with a long tag: #DontJudgeMeIReallyLoveTMZ ~!!! You'll often see hashtags as the punchline for a joke tweet. #ObviousObservation. When I'm in a silly mood I'll throw them out everywhere. Otherwise I'll use a hashtag whenever I'm referencing an ongoing narrative in my stream. It's not perfect, but it helps tie things together. Funny!! 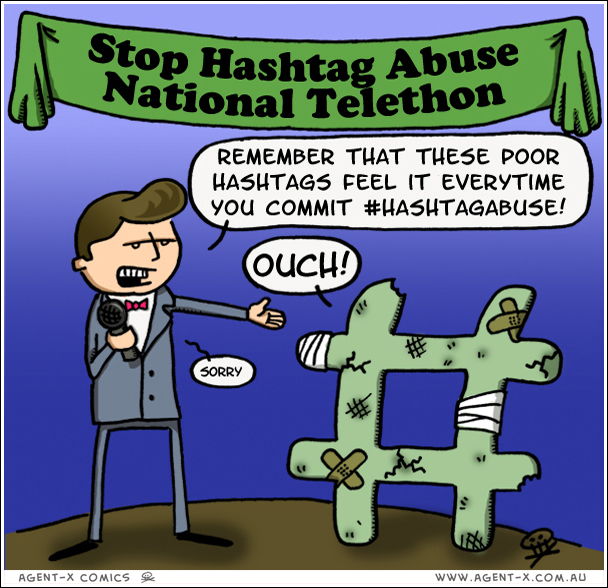 I still don't completely "get" #hashtags! Kathy: Uh oh! Yes, I'm afraid to say that hashtagitis CAN be transmitted by mere suggestion. If you think you have symptoms, it may be too late for you. Give into it. #DoNotFightHashtagitis. Amber, I am not fluent with twitter, let alone the fun that can be had with #hashtags. In need of some of your probono work. Kidding aside, this is one of the funniest things I have read in a while. I just can't imagine the time you put into this but you are sure bring a lot smiles and fun into a lot of lives. Thank You. I just found this earlier today thanks to a LinkedIn group. There are a number of people to whom I must introduce this blog entry. Excellent, Ed! Glad to hear it. Always happy to meet more people who have the #HashtagMonkey on their backs! Hi Rachel, thanks for contributing to the discussion! If you have a specific message that you want to tweet (e.g. saving a dog from death row), those 140 characters are important and I completely understand not wasting them on a silly hashtag. #OMG....I don't think I have it..but #OMG..I can't stand to look at tweets that are ladened with them. My eyes need #help whenever I come across theses things. I have a standard set of hashtags that I use when I am announcing adoptable pets in NY because I have a feed on my blog that reads this set of hashtags...other than that....I don't use them too often because they "hurt" my eyes. I do one and only one hashtag called #petTheories in which house pets have a voice, and they are proving to be quite insightful, thought-provoking citizens thanks to the 140 character length limit. Lately, however, my dog's "woofs" to that hashtag have been evaporating entirely -- except they do appear on my Home and Profiles pages. Alas. Any advice? Thanks! If I understand correctly, you're saying that not all your tweets with the #pettheories hashtag are showing up when you search that hashtag, correct? If so, all I can say is...that happens. There are glitches sometimes and we all experience them at one point or another. There lies some beauty in a plain pure text tweet put wisely. Looks less pretentious and much more personnal and authentic. 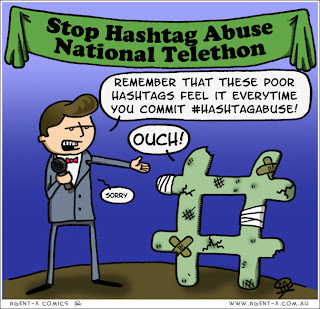 One sometimes really gets messed up with #Hashtagitis, and some are - in context - just show offs I fear. On the other hand I consider #hashtags as means to signal the whatabout of an issue in an ultrashort way, this esp. when using acronyms. Used this way they help enhance your adhering to a group you want to drop a message (or belong to). And to my experience it brings on followers. I guess one should use #hashtags wisely. IMHO I consider them in part as a sort of typografic-intellectual form of art, you might have to be a little skilled for effective use though. Great funny posting and comments, gave me insights, thanks! There lies some beauty in a plain pure text tweet put wisely. Looks less pretentious and much more personnal and authentic. On the other hand I like #hashtags as means to signal the whatabout of an issue in an ultrashort way, this esp. when using acronyms. Used this way they help enhance your adhering to a group you want to drop a message (or belong to). And to my experience it can bring on followers you want adress. I am sorry, twice was not intended! Please feel free to delete one. I too cross it over almost everywhere, Facebook, (super casual) emails, or even texts :D #totallyhelpless #heyitisfun #tryit! Thanks for adding your thoughts to the discussion, Jeannette! Yeah, if you're at an event or conference, using the hashtag for the activity can certainly help you connect to new people and gain new followers. It's a wonderful way to connect! Yay, Nita! Welcome to our little support group! BTW - Diane Bjorling pointed me here after I wrote a post on Twitter. Welcome, Sherryl! Also great to meet another #HashtagAddict.